The success of liquid phase sintering by B addition has some limitations and it is difficult to control in practice especially in the iron PM steels consisting of alloy elements such as C or Mo due to B can form stable phases with another elements result in alters the phase composition in both matrix and boride network. 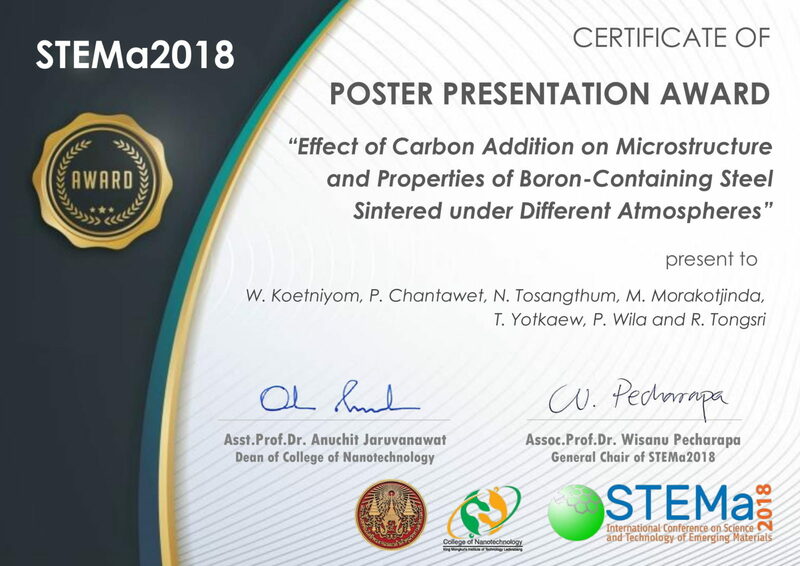 Carbon plays important roles in both matrix microstructural development and intergranular liquid phase formation and boron can react with constituents of the sintering atmosphere such as hydrogen to form volatile. This work aims to investigate the sintered Fe-1.5Mo-0.22B-xC steels (x = 0.1-0.4 wt.%) sintered under hydrogen and vacuum atmospheres. The hydrogen-sintered Fe-1.5Mo-0.22B-xC steels hardly showed evidences of intergranular liquid phase whereas the vacuum-sintered steels showed clear evidences of intergranular boride. Deboronization was believed to contribute to the intergranular boride absence in the hydrogen-sintered steels. For reaching the optimal combination of density, strength, and ductility, boron should be sufficiently low that only local boride eutectic remains and formation of interconnected areas is impeded.